Send email messages from your PHP-application using Mail. Is there a better alternative to LocalhostMail? Is LocalhostMail really the best app in Email category? 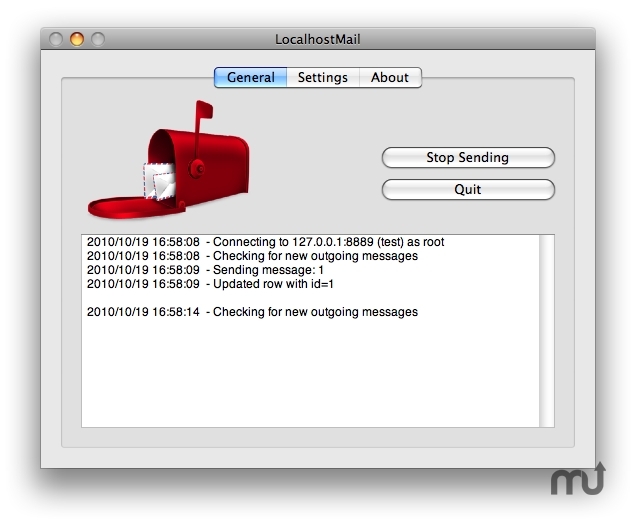 Will LocalhostMail work good on macOS 10.13.4? LocalhostMail is a simple and fast solution for Mac OS X that lets you send email messages from your PHP-application (or any other, located on localhost) by Mail.app included with Mac OS X. If you use PHP, just add to MySQL database new messages, and our application will send them through a Mail application. LocalhostMail uses your mail account in Mail.app to send these messages, so you do not need a separate SMTP-server for your localhost. MySQL (available from the MySQL website. LocalhostMail needs a review. Be the first to review this app and get the discussion started! LocalhostMail needs a rating. Be the first to rate this app and get the discussion started!